Credit cards can create the illusion that you have enough money to purchase things. In reality, you actually can’t afford them. 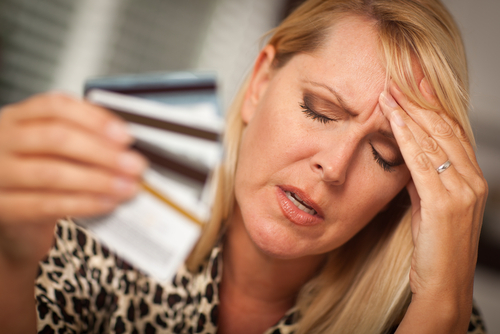 If your card gets declined, it might be a warning sign that your spending is out of control. Instead, try to use a cash allowance you withdraw from the bank to make all discretionary purchases. This will help you make sure you’re not spending money you don’t have. It may even make it harder to let money go which is a good thing. It’s generally not a good practice to utilize your credit lines for every transaction anyway. Doing so will make you more susceptible to factors that can negatively impact your credit score, like missing a payment. Although there are numerous factors that make up your overall credit score, the two aspects with the most significant influence are your payment history and your credit utilization. Your payment history is a predictive assessment of risk based upon the historical timeliness and amount of previous payments. This speaks to your ability to make future payments. Credit utilization reveals to what extent you’re using your available credit. You may think that putting $800 on a card with a $1,000 limit and paying it off accordingly is within good financial practice. However, this reports to your credit card company that you are using 80 percent of available credit. In most cases, you should aim to use less than 30% of your available credit. This helps avoid negative repercussions to your credit score. Having a credit score of 700 or above indicates good financial behavior and is ideal for lenders. Not only does coming up short on your bills feel bad, but asking others for help is downright embarrassing. To avoid this situation, get your finances in order by establishing a bill schedule and payment calendar. Create a budget that prioritizes necessities, like covering monthly bills, paying off debt, and setting aside savings each month. Also, trim out unnecessary spending. By keeping track of your spending habits, you’ll quickly identify the areas where you can scale back and create more room in your budget! For many Americans, housing is their largest monthly expense. While it’s normal to want to indulge in a lavish estate, overspending on housing can put the rest of your finances in jeopardy. Your housing costs are comprised of your mortgage payment/rent, property taxes, and homeowners’ insurance. this three things should not surpass 30% of your paycheck. Doing otherwise will force you to make some major concessions in your budget. According to the 2017 GOBankingRates Retirement Savings survey, 34 percent of respondents did not have anything saved for retirement. Additionally, 21 percent had less than $10,000 set aside. Those are some scary numbers. It’s easy to want to spend all of the money you make. After all, we would all like to enjoy the full fruits of our labor. However, it’s important to realize that someday you won’t be able to work. You want to be prepared when it comes time to retire. It is typically advised to set aside a minimum of 10% of each paycheck for emergency savings or retirement. To help with this, some mobile banking companies allow you to automatically set aside a portion of your paycheck to a retirement savings or emergency savings fund. This is a great step to help you build discipline. An alarming number of Americans do not have a financial cushion to support any unplanned expenses. In fact, about 46 percent of Americans say that they do not have enough money to cover $400 in emergency expenses. That’s an even scarier percentage than the retirement numbers mentioned earlier. These people choose to fund emergencies through credit cards, friends or family, or simply not cover it at all. This can be a risky situation to put yourself in. There’s no telling when one might face a job layoff or a medical problem. The basic recommendation is to set aside 3-6 months of living expenses. This will help you manage through any difficult situation. You will only spend on the absolute necessities when the time comes. In conclusion, you can’t afford to ignore these warning signs. They are simple ones that you should readily pick up on. Ignoring the obvious won’t help solve your financial challenges. It may be fun for a time to live above your means. It may give you a thrill to get all those things you’ve always wanted. But in the end, you are doing damage to your long-term financial success. It’s time to get a plan and get moving on a lifestyle that is reasonable and sustainable. Questions for Discussion: What are some other signs you are living above your means? How can you have the discipline necessary to survive in our consumer driven culture? In this consumer-driven world we live in, discipline is necessary. There are a lot of things we purchase that are unnecessary and are just a waste of money. Keep track of your finances. Budgeting is something my grandmother taught me. Thanks for sharing this informative post. Cheers! Really enjoyed that blog post but what amazes me is that I’ve witnessed people who experience all six stages of living beyond their means, but don’t take it as a warning sign. An education in the basics of budget and making sound financial decisions really does need to become part of every school curriculum.